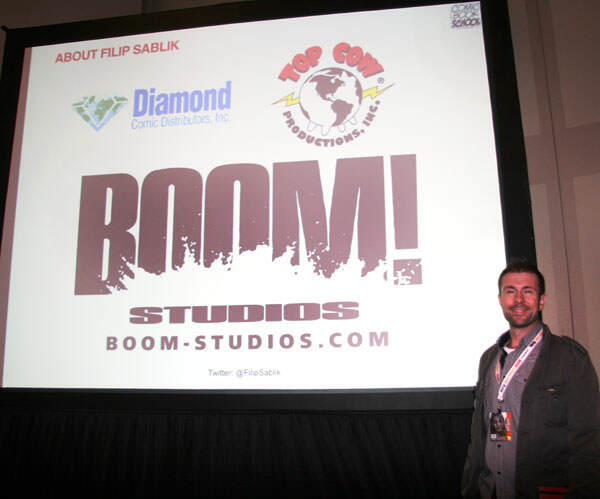 Filip Sablik of BOOM! Studios following a Comic Book School panel at NYCC 2012. This week, I interview Filip Sablik, Vice President of Publishing and Marketing at BOOM! Studios. Filip is a longtime industry insider who you may remember as the Publisher at Top Cow Comics. I met Filip over a decade ago when he was my contact over at Diamond Comics. He is a smart guy who has participated on my Comic Book School panels at New York Comicon. BUDDY SCALERA @ COMIC BOOK SCHOOL: What’s one thing every artist should include in their convention portfolio? FILIP SABLIK: Sequential pages. Comic books are about story-telling rather than beautiful rendering or striking illustration. The sequential pages should tell a clear story without any dialogue or captions. COMIC BOOK SCHOOL: What’s one thing you saw last week that you’ll incorporate into your comic book storytelling? FILIP SABLIK: Not sure if there’s anything specific from last week, but I was reviewing advances of DAY MEN: PEN & INK #1 (http://bit.ly/R1NPmm) with annotations by artist Brian Stelfreeze and writers Matt Gagnon and Michael Alan Nelson. It’s an amazing behind-the-scenes process book and Stelfreeze in particular is a master class in story-telling. Lots to learn from that book! FILIP SABLIK: DEAD LETTERS by Christopher Sebela and Chris Visions (http://bit.ly/1k15owY). My favorite first issue I’ve read this year thus far. FILIP SABLIK: My Macbook Air, a second monitor, wireless keyboard and trackpad, gum, photos of my daughters, coffee and water, my day planner, my phone, and advance copies of Savage Brothers Deluxe Edition (http://bit.ly/1hZdGVB) and RoboCop: The Human Element (http://bit.ly/1g5IKyR) trade paperbacks. FILIP SABLIK: These days mostly my Macbook Air if you consider marketing plans, contract negotiations, and publishing plans creative (which I do). Buddy’s Note: This interview appeared originally in the Comic Book School Newsletter. Sign up for the newsletter.